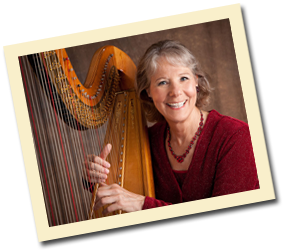 Roxanne Ziegler has been in demand as a wedding harpist in the upstate New York area since 1970. She feels honored to have been chosen to play in hundreds of weddings, providing just the right atmosphere, elegance, and musical beauty to wedding ceremonies and receptions in a wide variety of venues, both indoor and outdoor. An accomplished, professional performer, Roxanne knows how to go with the flow of wedding ceremonies and receptions, whether they come off as planned or if unexpected situations occur. She understands what the bride and groom and their families are striving for musically and delivers it without exception. Whether the wedding is in a large church, small chapel, an intimate home setting, on the manicured grounds of a landmark mansion, in a private back yard or at a lakeside retreat, Roxanne has the expertise to organize and tailor her instruments and music to the location and needs of the situation. Roxanne offers a wide repertoire for brides and wedding couples to choose from, including contemporary, classical, Celtic, renaissance, and sacred music. Her consultation includes discussion and selection of the songs that will provide a charming atmosphere and add elegance to your wedding ceremony. 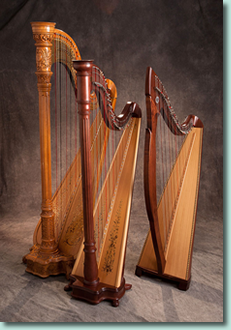 Visit Roxanne's Harp Music Repertoire for sample lists of wedding songs and Wedding Music Demos for short audio clips to hear Roxanne's beautiful wedding music. Roxanne works with you to craft a program of music and performance to enhance this most special day. 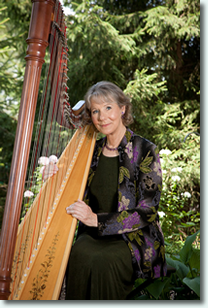 She is a harp soloist and performs in distinctive duos with flute, violin, vocalist, or hammered dulcimer. She will happily work with a singer or instrumentalist of your choosing or can help locate another accomplished professional to produce the sound you are looking for. She has played in a wide variety of indoor and outdoor venues and has the equipment and harps to perform well in any of them. Please visit her music demo page for sample MP3 recordings or her repertoire page for sample lists of song titles. Family or friends of the bridal couple often wish to do something special for them on this day. A unique wedding present is this gift of live harp music performed by a talented, experienced, sensitive harpist whose music brings meaning and adds to this celebration of love.